When thinking of the nature and purpose of an archive, there is a danger that it will be seen as an entity fixated upon and concerned purely with the past: of interest, primarily, to the historian and the antiquarian, and perhaps of limited relevance to contemporary concerns and activities. However, it may be said that of all people, the Christian should be most firm in rejecting this idea. Through the Incarnation of Jesus Christ it is affirmed that the Godhead decisively intervened in human history, such that past and present are united through the redemptive activity of Jesus Christ. Thus, as the Catholic Church has affirmed, history read aright demonstrates the Holy Spirit working through successive witnesses to the living tradition: in the words of the late Archbishop Michael Ramsey, the Church is a ‘community of experience reaching across the generations’. This may be all very well in theory, but how in practice are past generations of Christians to speak to us now? Undoubtedly one way has been via the sense of place, the idea that there are certain places where the presence of God may be experienced particularly strongly; a ‘Holy Place’ or hallowed spot where tradition bears witness to the activity of the People of God. In the Catholic tradition this is particularly associated with the lives and activities of the Saints. It is known that Mother Magdalen Taylor herself had great devotion to the holy people and Christian traditions of the county of her birth, despite the fact that she was only ten years’ old when her family was forced to leave their Lincolnshire home on the death of her beloved clergyman father. Her own extensive writings bear eloquent witness to her love of history, and her desire to celebrate and promulgate the traditions of the Catholic faith. It may thus be said that the tradition of pilgrimage in the congregation which she founded is very closely associated with her own charism or spiritual identity. Fortunately, there are very important collections in the archives which bear witness to the congregational tradition of pilgrimage ‘in the Footsteps of Mother Magdalen’, particularly amongst the papers of the late Sr Rose Joseph Kennedy SMG, who for a period was vice-postulator of the Cause for Mother Magdalen’s Beatification, and whose archive, still only very partially catalogued, covers virtually every aspect of Mother Magdalen’s work and journeying. The origins of the tradition are, however, not easy to locate, and the evidence is fragmentary. Amongst Sr Rose’s papers are a fascinating little group of photographs of Stoke Rochford in Lincolnshire, (dating perhaps from the 1950s) where Mother Magdalen spent her early childhood (one of them is shown right). There are just a few tantalising annotations on the reverse of the photos, indicating that they are a record of a visit from St Helens in Lancashire, where the SMG congregation administered a hospital from 1882. 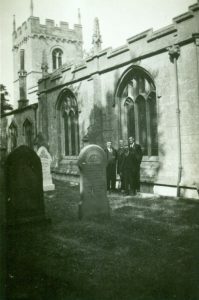 If you look very closely at the photograph you may see that there are four figures at the centre right, one of whom appears to be a clergyman. Alas, unless we find another source of information, the details of this early ‘pilgrimage’ are likely to remain mysterious. It is certainly known that many SMG Sisters in the past went on their own unofficial ‘pilgrimages’ to Stoke Rochford, and in 1984 Sr Rose recorded that Mass was offered in this beautiful, ancient church for the delegates to the SMG General Chapter who had just elected a new superior-general. The tradition of pilgrimage to Stoke Rochford is now well established, and the publication once edited by Sr Rose ‘Pray and Promote’ (now edited by Sr Mary Kenefick SMG) is a marvellous source of information on SMG pilgrimages old and new. The other very major ‘locus’ of the SMG pilgrimages is the area of west London where Mother Magdalen and the early Sisters worked and lived with the poor, and where the early labours of the congregation were focused. The congregational annals, in Mother Magdalen’s own hand, record that the group from which the congregation was shortly to be founded first came together in October 1868 in four little rooms just off Fleet Street. The formal beginning of the modern London tradition of pilgrimage may be firmly dated to 1992, when it was decided to honour the centenary of the death of Cardinal Manning, one of Mother Magdalen’s earliest and most important friends and supporters, by researching and visiting the sites of the earliest SMG houses in London. A group of nine SMG Sisters came together to carry out historical research, both in the congregational archives and elsewhere. 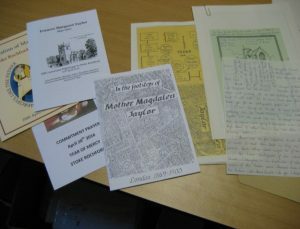 A very valuable source of information on the London (and other) SMG pilgrimages is contained within the papers donated in 2007 by Sr Maria St Joseph O’Rourke SMG to the archives (some are depicted above, top), and the success of this project may be said to be reflected in the fact that the pilgrimages have in recent years become an annual event, under the leadership currently of myself and Sr Mary Kenefick SMG. 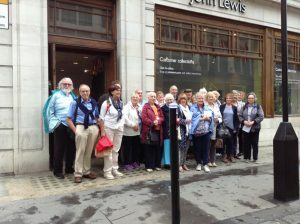 The photograph on the left (donated courtesy of Sr Annie Lunney SMG) shows a group mainly of SMG associates from the north-west of England, standing in September 2016 at the site of one of the many humble SMG convents (near to Cavendish Square, W1) which have a ghostly existence now only in old maps, documents, rate books, research papers, and in the cherished traditions of the SMG congregation.